June 27, 2014 February 26, 2019 - The 'Noms. 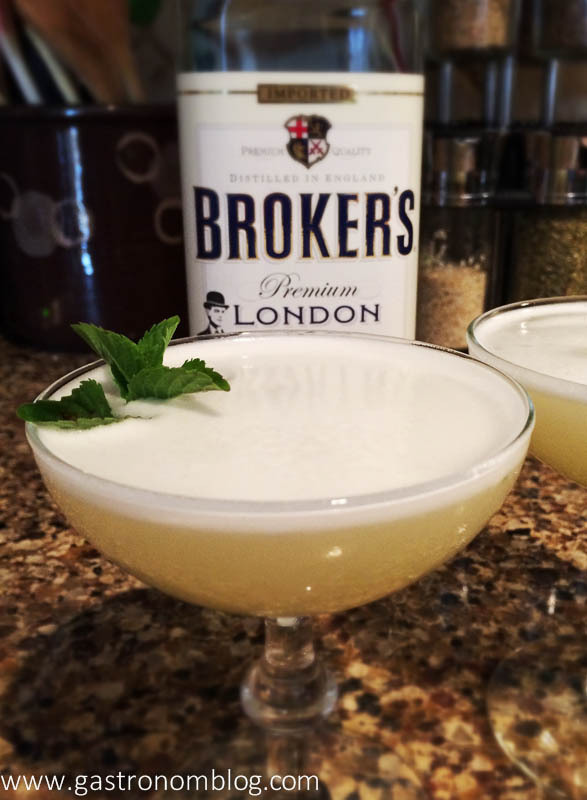 This cocktail is a spin on Brett Elser’s London’s First Love Affair, which was the winning entry for the Southern region of the Broker’s Gin Bowler’s Cup cocktail contest. Since I didn’t have all the ingredients on hand (oregat syrup) I decided to change things up a bit and modify the recipe. Refreshingly sweet with a nice creamy texture from the egg, the fresh mint and lemon balm open up the aromatics of the gin. Gin based cocktail with amaretto, mint and egg white! Place the leaves into a shaker and gently muddle them to release the oils. Add in the remaining ingredients and shake without ice for around 30 seconds. Add ice to the shaker and vigorously shake for another 20 seconds. Strain into a chilled cocktail glass and garnish with a fresh mint sprig.